Individuals enrolled in standard first aid training will learn cardiopulmonary resuscitation (CPR). 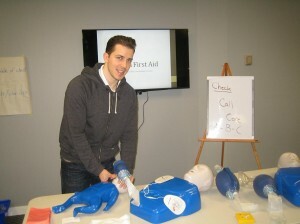 This is an essential component of first aid training and is the primarily taught as the initial subject in the course. Not all standard first aid programs are identical because candidates can vary the level of cardiopulmonary resuscitation that comes with the course. This page will outline the level’s of training that our training providers (found at our locations page) offer as part of standard first aid. Candidates must select one of these level’s. Standard first aid can not operate as a stand-alone first aid program and must include CPR training. CPR “A” (Basic life support CPR)This level of CPR training is the most basic available. Non of our providers offer this level of CPR training and instead offer more comprehensive levels. Only a small number of providers will partner this CPR with standard first aid. CPR level “A” teaches participants rescue techniques for only adult victims. In a stand-alone program this CPR course would take approximately 4 hours. This CPR level comes standard with our providers. This is one of the most comprehensive CPR programs available. It is easily the most popular. In this program candidates will learn to recognize and manage victims of all ages. Students will also learn complications and advanced CPR techniques not covered in CPR “A”. The entire CPR “A” curriculum is included in this course with an additional 2 to 3 hours of content. This course takes approximately 5 hours to complete in a stand-alone CPR course. This CPR level is designed for individuals that work in the health care environment. This CPR level encompasses all of CPR level “C” and includes advanced components including CPR with the use of bag-valve masks and trained assistance. This level of CPR combined with standard first aid can make the course a little bit longer. In a stand-alone format CPR “HCP” takes approximately 6 hours to complete. All of these program incorporate automated external defibrillator (AED) training. For more information about each of these CPR level’s select the level of choice from above or from the menu. It is important to remember that each province in Canada has different requirements for the length of time for each CPR and standard first aid course. Check with one of our providers to find out the length and availability of a course in your area.